Before European settlement, the coastal waters off what is now Canada were home to massive schools of giant cod. Huge herds of walrus were living as far south as Nova Scotia. Oysters, lobsters, capelin, herring, sturgeon, squid and salmon were found in astonishing abundance. It was a treasure trove for any European fishermen who dared go there. They may have visited there for centuries before Columbus accidentally landed in Central America, but fisherman leave no artifacts, and certainly did not want others to know of their special fishing grounds. There is proof that the Norse predated Columbus’s arrival by nearly 500 years. At L’Anse aux Meadows in Newfoundland, the remains of an early 11th century Norse village can be seen even today. In November 1898, a farmer near Kensington, Minnesota, discovered a stone with engraved runes telling of a Norse expedition through the Great Lakes in 1362. This completely altered the known history of European exploration in the Americas — but is the stone genuine? Many university scholars have studied the runestone, and it was on display at the Smithsonian Institution in 1948. Most scholars have concluded the runes are fake, but others insist the stone is the real thing. The idea of Vikings venturing inland continues to intrigue people, but there is no proof to date that the Norse sailed into Hudson Bay or through the Great Lakes. In 1969, modern explorer Thor Heyerdahl successfully sailed across the Atlantic in an Egyptian reed boat to prove that the ancient Egyptians could have done it. The Greeks and Phoenicians had ocean-going vessels, too. Did any of them cross the Atlantic? No one knows. 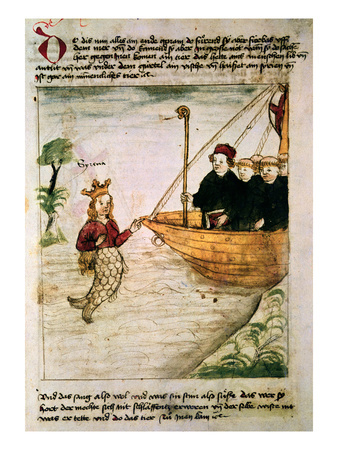 According to Irish legend, the monk St. Brendan reached North America in the sixth century. The account of the voyage was published as the Navigatio Sancti Brendani (“Travels of St. Brendan” in Latin) some 300 years later. In 1976, Tim Severin sailed a replica Irish boat called a curragh from Ireland to Newfoundland, showing that St. Brendan could have made the journey, but no one knows if the saint actually made a similar trip. Two petroglyphs (rock carvings) were discovered in West Virginia in the 1960s. Geologist and archaeologist Robert L. Pyle believes they were written in an old Irish script called Ogham. But other scientists concluded that a linguistic analysis does not uphold the theory, and no related Irish artifacts were found. Apparently, if Brendan landed there, he left nothing behind. There is a persistent legend that a Welsh prince named Madoc arrived in North America in 1170. This story was retold in 1580 to persuade Queen Elizabeth I of England that much of North America belonged to the British. Explorers who visited or lived with the Mandan people of North Dakota, including the Lewis and Clark expedition in 1804-05 and nineteenth-century painter George Catlin, reported that their language was so similar to Welsh that the Mandan people understood it. However, a Welsh traveller named John Evans spent the winter of 1796-97 with the Mandans while searching for the “Welsh Indians”. His conclusion? There weren’t any. If Lewis and Clark found Mandans who understood Welsh, the Mandans had probably learned it from Evans eight years earlier. It is harder to explain why, prior to known European contact, so many Mandans were light skinned and had brown, blonde or red hair and blue or hazel eyes, instead of having black hair, brown eyes and darker skin like their neighbours. Some people suggest a Norse influence, but the land of the Mandans was a long way from the coastal waters of the Atlantic. An analysis of Mandan DNA might solve this mystery, but the Mandans were nearly wiped out by smallpox in the 1800s. The few survivors were adopted into other tribes, and intermarriage with those tribes and with people of other nationalities makes it impossible to arrive at an answer using DNA from living Mandan descendants, if any could be found. 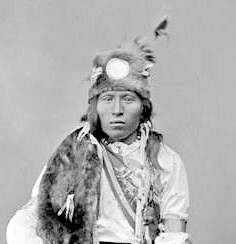 Little John, a Mandan photographed in 1880. The most recent claimant to have discovered America is China. In 2002, amateur historian Gavin Menzies wrote a book claiming that the Chinese Chinese admiral Zheng sailed to North America in 1421. Four years later, a Chinese lawyer went public with a map supposedly dated 1418 which showed North and South America. The map has been declared a copy of a European map made later in the century, but its origins remain unclear. Another claim lies with a Scottish earl from Orkney named Sir Henry Sinclair, who supposedly arrived in North America in 1397 on the first of several voyages he made to the New World. 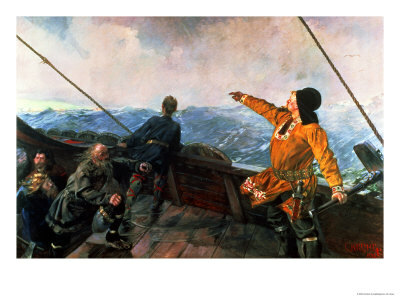 Even if the Chinese or the Scots or the Irish or the Welsh or the Greeks or even the Phoenecians did arrive in North America before the Norse and well before Columbus, the simple fact remains that none of them, not even the Norse, "discovered" America. Thousands of years ago, the ancestors of today’s Native people were the first to explore the continent, arriving over the Bering land bridge or by sea. So who discovered America? They did. If your curiosity has been piqued about the stories of these various voyages to the Americas, give these books a try! Whether filled with truths, speculation or a mix of both, they will reveal the complexity of unravelling the true early history of the Americas. There is a television series where the host visits some of the evidence of earlier settlers. There seem t have been many possibilities. Yes, the "Welsh Indians" theory is untrue, according to John Evans who searched for them in the late 1700s. But theories about pre-Columbian voyages are constantly being brought forward, and all have their detractors and supporters. Without definitive proof, they remain merely theories. There is so much more that could have been included in this article, like the Lake Titicaca reed boats that look like Egyptian reed boats, the Olmec heads, and so on, but then my article would have turned into a book! It is such an interesting topic, and this just skims the surface. I hope it prompts people to do more reading. There needs to be a lot more archaeological research done too. A rather scholaly Welsh gentleman informed me that the Welsh story is untrue. I am convinced that St Brendan reached America, but he would not have used Ogham, but the old Irish script, which is related to our modern alphabet, as the ogham was used by druids. However, when I was ten I read in a book about how "man" discovered America in 1492. Even at that tender age I realized that this forgot that the Amerindians were "men" [no sexism meant here, ] Official history books wrote off indigenous peoples, quite disgusting really. There is a great book called "Across Atlantic Ice" which suggests a European movement into Eastern America in the Ice Age. You will also note that Olmec carvings in central America seem to show African faces, indicating that black Africans also reached the continent before Columbus. Hence my final paragraph stating that the Native people were the first ones to "discover" America. They were here long before anyone else. One reason so much of the dating of the Native arrival in the Americas is controversial is because the glaciers of the Ice Age destroyed a lot of evidence for pre-glaciation occupation. There could be evidence in Central and South America that has yet to be uncovered. It is a very interesting topic, to be sure! I'd say the first people to "discover" the Americas crossed the Bering Straits by a land bridge that existed until about 30,000 years ago. The date of the arrival of the first humans is debated among scholars and may be anywhere between 50,000 BCE and 15,000 BCE. There are some who believe Aboriginal People were always here in the Americas. Nice article. There's a book by the title of "Before the Mayflower". In it, Africans claim they were the first to discover North America. As someone with Native American heritage, I find all of these theories amusing. It's believed that Native Americans came here from China by way of the Bering Strait before it was covered with water. If that's true, I'd say Native American's discovered America. We may never know for sure.